I vectored the scan, drew the sakura petals, added and edited the effects and added some magical lights. Took me about 8 hours to finish this wallpaper. Version without "Der Tanz einer GÃƒï¿½Ã¯Â¿Â½Ãƒï¿½Ã‚Â¶ttin"
Two submissions in just one week.. >> sorry guys.. This wall has such a delicate and almost ehtereal quality to it. The appearance is deceptively simple, yet when you look closer it's shockingly detailed. Magical, graceful and thoroughly charming, this deserves to be highlighted. Proposed by shyxsakura and highlighted by Saikusa. Gorgeous! It's really worthy of an Anime DVD or something! It's so great what simple details can make! Obviously I'm not deppreciating the work and effort you put on it! Congratulations! My respects for you...*3 thumbs up"
I really love this. The colors, the softness, the whole idea is just fabulous! Excellent job! Nice work, and I love the idea, but there seems to be a little quirk in it. A petal is blocking the S in the wallpaper so it looks like it is saying Akura Dance. Other than that it is a awesome wallpaper! gosh O_O this wallpaper is beautiful! nothing more said! its going into my fav and my desktop! good job sweetie! 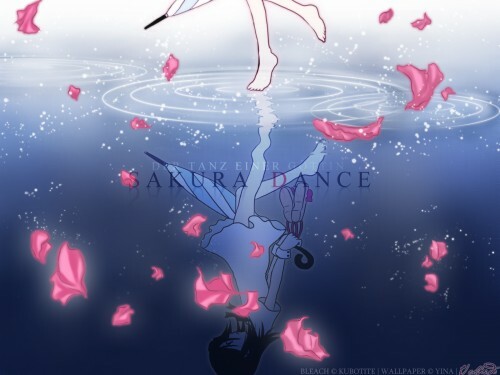 simple and gorgeous looking wallie ^_^ the idea is really unique and it's really interesting, since you put the character to be seen from the reflection. seeing the character's feet on the bright side of the water and the reflection in darker blue water, gives the feeling of mirrors in two different world. you did good job with the vectoring. like the way how light upper part of the wall goes darker when going lower to the water, it gives nicely depth and blue colour is quite peaceful. sakura petals are pretty details and pink colour gives nicely brighting touch. the glimmerings and waves gives the feeling of her walking on the water but they also gives little magical atmosphere. overall really beautiful work and thank you for sharing ! wow... I don't know what to say... I just... oh well, it's beautiful. Again you've done something amazing. THis wallpaper is fantastic. You did a great job with the background , petals and vector. To my favorites :). Incredible work :). I really like how you placed the scan in both parts, the surface and the reflection. It's really good compostion. :) This is a really good piece of work. It's great to see such an original and expressive Bleach wallpaper... Definitely going to be one of my favorites. Congratulations! ooooohhhhh prettyful! XD i lurve it, great work! wahh, its soo beatiful. i like the reflection, and the sakura petals. It's simply beautiful! Really love those sakura petals <3 and the reflection...nice job! It's so fragile and peacefull! OMG...this wall is absolutely awesome! its simple..but so pretty! your walls are awesome! *sets as desktop bg* and adds as fav! Those little light-effect you've put are like a magic.